This interview with Hungarian political philosopher G.M. Tamás first appeared in The Dissident Blog–a publication of the Swedish PEN. 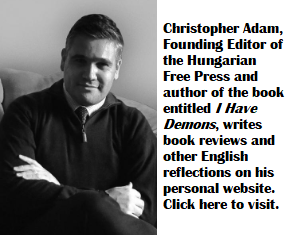 Mr. Tamás offered us this interview to share with readers of the Hungarian Free Press. The philosopher explains why freedom of speech and democracy are in decline in Hungary and also speaks about how Budapest is a type of intellectual bubble within the country. 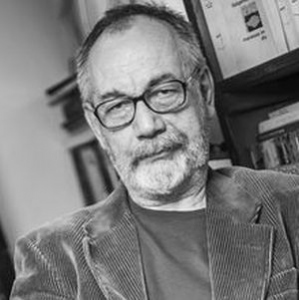 G. M.Tamás is a philosopher and public intellectual. He writes primarily about political and aesthetic questions and has been published widely in international media. He is known for developing the concept of post-fascism. For this issue of The Dissident Blog we have gathered texts, both non-fiction and fiction, about the state of freedom of speech in Hungary. Some of them point to the fact that on one hand anyone can speak freely, on the other hand, that the channels of expressing this right is highly limited – the state has gained control over both public service and most of mainstream media. How do you view the state of free speech in Hungary right now, with just a month to the upcoming elections? – The problem is what the centrally organised media conglomerate in Hungary does have to say and what it does say. Which is nothing else but the most savage racism and ethnic hatred. Everybody who does not agree is branded a communist, a closet homosexual, a paid agent of ‛Abroad’ (Ausland) or the flunkey of a nebulous ‛global shadow power’ that bears distinctly Semitic features. Mostly the face of George Soros, of course. All this results in bewilderment, hatred and fear. About one half of the population finds this grotesque, risible and fearsome, but does not do – and what is worse – does not say anything about it. You’ll find ‛opposition intellectuals’ if you’re a foreigner who will tell you how disgusted they are but in the remaining, relatively free opposition press they won’t say anything, citing ennui and disenchantment with ‛politics’ as if racist madness and dictatorship would be identical with emancipatory, egalitarian, feminist and, in general, freedom-loving politics. Good politics and bad politics are the same, liberty and tyranny are both political, thus despicable. Press freedom is relative. During the second world war, the Budapest social democrat daily, Népszava [The People’s Voice], was censored but published, while hundreds of thousands of Jews were dragged in broad daylight on the streets of Budapest to their deaths – the theatres, the cinemas, the cabarets were playing, the football championship went on and popular magazines offered young Christian girls good tips for a successful technique in flirtation and the latest in fashions. So? – We have, I am told, excellent poetry readings and experimental film festivals, daring books are being published (though fewer titles, and circulation numbers are more modest) while Syrian and Afghan refugees are starving and suffering and waiting endlessly at our borders and almost nobody seems to care, even a little. When visiting Hungary, one cannot avoid the weight of how the government broadcasts its message now even in the physical environment, through giant billboards all over towns and countryside. I have visited Hungary regularly over the last twenty years, and for me this development is unparalleled, and renders the landscape a slightly absurd air. How do you, as an intellectual, cope with this, seeing and hearing these messages everywhere, every single day? Or do you just look the other way? – It is not only the billboards, it’s the press and the flyers in my mailbox and the radio when I am searching for good music. But I don’t care. And I don’t care because nobody cares or people, at most, are laughing. This is an irresponsible and superficial country. It is they, my fellow citizens, who horrify me, and the schoolchildren who are yelling ‛migrant, migrant!’ at one another when they are playing catch in the park. It is the 80 percent of my compatriots who are anti-immigrant and anti-Roma, it is the 40-50 percent who are homophobic and anti-Semitic who are scary, not the billboards. For billboards, you need only money and the complicity of pliant local government. And I am not looking the other way, I am fighting, although with less and less hope and, frankly, I am getting tired of these quixotic efforts myself. The opposition papers call racism ‛idiotic’ and ‛boring’. Hence, it is vulgar, it is in poor taste to protest. ‛And, let’s be realistic, Muslim immigrants are a headache, now be serious, old man, and forget all those sentimental bromides about human rights and about the brotherhood of man (not to mention sisterhood).’ We all know that self-censorship is more dangerous than censorship. Laughing at fascists while failing to disagree in substance is nothing. And this is what is happening. Gergely Nagy writes in a text about the art field, that Budapest is a kind of bubble, where funding is scarce, but a limited free art life exists. How would you, as an academic and writer, reflect on Budapest as an intellectual bubble? – Budapest is an intellectual bubble, but this was so even before 1989 regardless of so-called censorship; today there is a free art and intellectual life as well which is quite vivid but by no means inventive. And our pride, irony. You have any number of manifestations bursting with cynicism, bitterness, parodic verve and self-mockery, quite entertaining, granted. But this is only the obverse of the official pathos which is being found ridiculous and bizarre, and this is no challenge to the Right, let alone a match for it. It is too little, too late. I used to be, to a certain extent, part of this ‛bubble’ scene myself, but as I am unable (not unwilling) to smile and to be amusing, I somehow drifted away, unwelcome. So, this ‛Budapest bubble’ is a sign of life but it would take a little moral and intellectual effort to make it subversive and really critical. Even in Vienna – certainly no model for anti-fascists – when one of these far right cabinet members said that he aims at ‛concentrating’ undesirable foreigners, the echo of this word (reminiscent of concentration camps) was enough to send tens of thousands of Viennese onto the streets in protest. In such cases, our opposition politicos would say, oh, let’s talk about the health service instead. Or about corruption. Never is heard a dissenting word. Although – and this is the supreme joke – this is not forbidden. No different from what is going on in every Western country today. Establishment voices get all the space, with all dissident voices being marginalized and vilified. I would like to ask Mr. Adam in his experience as a Canadian, whether he is old enough to remember a single time in the last few decades when a member of Canada’s parliament stood up and suggested that the mass-migration that Canada is subjected to by its elites is not necessarily a good thing for the longer term, because among other things it will forever change Canada’s founding culture and demographics. My understanding is that Canada is gradually turning into a land dominated by mostly Asian ethnic enclaves. I have seen it on a number of occasions visiting, especially West of Quebec. Surely it is something that should be discussed, debated. After all, it is no small matter to completely change a country’s culture like this, not to mention the consequences of ethnic enclavisation, with entire cities or neighborhoods being taken over by one particular ethnic group. My understanding is that this enclavisation is also happening in the work environment more and more often, which is basically a form of discrimination towards everyone else. What will happen to those who do not belong to a particularly strong ethnic group some decades from now, when more and more workplace settings will be dominated by a particular group? When is the last time such a debate took place, discussing this issue? What would happen if a Canadian member of Parliament would dare to try to initiate such a conversation? Would he not be called the spawn of Hitler and a bunch of other things in order to silence that MP? So how is Canada different from Hungary on free speech? Other than that, it is outright cynical to point to Hungary and yell “anti-semitism”, especially from Sweden. If I had to wear a Jewish skull cap and would be given a choice between Malmo, Stochholm or Budapest, I would definitely choose Budapest, as a matter of personal safety! Anyone who claims otherwise or tells themselves otherwise are lying to others or to themselves. Disturbing to say the least – and I would wear a skullcap only in New York, parts of Florida parts of California and Israel.. I would remember daily the thousands and thousands of Jews thrown and drowned in the Danube, and I could not share my life, my work, and my money with a Hungarian non Jew. get out of there- guys and ladies you really are stupid like a duck (liba). Liba = goose, not duck. As TGM rightly points out, and the regular troll above wrongly concludes, neo-fascism is not a single issue phenomenon. Hungary’s authoritarian curtain has come down, not only on immigration, but on the rule of law, on justice, on pluralist political discourse. It blocks the entire avenue that enables citizens to freely evaluate the ethical validity of contending views about the just society, about constitutionalism, about sustainable economic development. In Hungary, parliamentary sovereignty is the instrument used for the abuse of the rule of law. The authoritarian curtain is made of the same material as the troll’s mask. It hides the identity of the “player”. The meritocracy it claims to represent is a meritocracy for crooks, who rob the poor, to feed the rich. Those who utilize the empirical method, first championed by Aristotle, can pierce through the smoke-screen, the affinity fraud being perpetrated on Hungarians as well as on those for whom emotional, fictional narratives are always more interesting than fact based discourse. One important and empirically verifiable fact is on the side of the trolls, and their puppet masters, and this is well documented by Yuval Noah Harari. Homo Sapiens is a species that owes it’s majorities, its “successes” o it’s affinity to emotional, fictional mass-mobilizational techniques. To the majority, facts are boring. This is what Mr. Orbán and his trolls are cashing in on, big time. This is why, without fail, all of the populist, neo-fascist regimes, such as Hungary, are destroying their public educational systems. To them, nothing is more dangerous, than the mind that is seeped in the empirical method. Peter, Canada is a melting pot, we in fact do have racists here too, but which culture gets superiority? The People with European ancestry wants it to be their culture, First Nations believe it should be them, there is also many more. Canada needs to be the place that it’s always meant to have been, multicultural! To those who wish to create division, I say we send you back to the home of your ancestors. We are in desperate need of immigration regardless of the right wing nationalists who want to push white Christianity as the “majority culture”. That is your opinion and it is fine to have such an opinion. But don’t you think that in a normal democratic society it should be up for debate? That was my point. The argument in Canada is a one-way street in this regard, which makes it as undemocratic as can be. I am sure there are voices that would like to respectfully disagree and debate, but they are bullied out of taking an opposing position by people like you, who rabidly attack anyone with an opposing view, as you just demonstrated here. So thanks for making my point in regards to the state of Canadian free speech. Your parallel comparison is totally incorrect. Canada was the land of the hods. To be an inhabited land by humans,and a country, needed people from all over they were willing to come. It never mattered who they were, where they came from, or what they looked like, etc. So now they all have learned to live in harmony. You Europeans start accepting and learning to get along in peace with all other humans. Just why do you object to such a simple reality ? Wake up and get real ! Forgive me for offering a different narrative of Canadian human history past, present and future, but I do believe you are off the mark once more, therefore you need to be corrected. You say the land needed people? There have been people well-adapted & living in Canada for thousands of years before the European colonization. Why you say they needed people? Then the Europeans arrived and turned the land into a paradise for themselves, while turning it into hell on earth for the incumbent natives. Now, through self delusions the incumbent, mostly European colonists are voluntarily losing the paradise they built for themselves to new colonists from other lands, mostly Asia. For the new colonists the land will also be paradise, but it will come at a price for the previous colonists, whose future generations will also experience hell on earth, just like they inflicted on the original populations. It may not necessarily be violent, but they will be marginalized and kept on the margins until they will be completely homogenized into the new colonist population, assuming that the new colonists will find it desirable to mix. I also believe that the mostly Asian new colonial period will bring about the final stage of cultural extermination of the original natives. They only experienced a recent demographic revival on the back of white guilt. Once that is gone, so will they be gone. At least the original natives have an excuse for losing their paradise. It came at the hands of a technologically superior colonist invasion, which gave them little choice. The new incumbent population however is doing it 100% out of collective stupidity. And, no I do not believe that the new colonial masters will repeat this mistake. One to five major ethnic groups will most likely claim hegemony and they will aim to keep it in their hands. It is a far wiser group that is coming! So no, Canada will not continue to be the land for people to move from everywhere. That will end in a few decades. Hungary is NOT a Constitutional Republic ! They only accept what they have practiced in their past. They hate everything new and foreign in origin. They are suspicious of every new ideas, and hate it all. They accept only what they feel makes them special. You are off your mark and full of BS. The European hod trappers have NOT oppressed any kind of local population. The Inuits are where they were before the white fur-traders arrived, so were very few “Indians” as well, most partook in the fur-trappings. You could have stated your allegation, ref. the so called Hungarian tribal conglamorets when they invaded the Carpatian basin. They did not, and do not accept all as same and equal. Just how come you are always silent on that. See “the rafter in your own eyes, before searching for a splinter in the eyes of others”. I don’t know why you find it necessary to share that piece of information with me. I agree, and have said so many times before. What I do know is, that the only reason why Hungary is not yet a fully fledged neo-fascist state is that it is part of the EU – The EU is Mr. Orbán’s major financial crutch, and he must keep up appearances to keep the money flowing. Just give it a bit more time, trolls. From crutches to crotches is only a breath away. I ma NOT Peter. You have anything to say to Peter, that is meaningful and perhaps reasonable,address it to him ! You are no less self-absorbed and self-centered bigot than your favored body Orban. Could you ever say anything on the actual subject than you repeated derogatory slandering? Any one not your puppet, must be a fascist , a troll and a bigot. That is all you can repeat, like a parrot. But that is just what you are yourself. I sure did not intend to share anything. Just attempted to remind you, that in a Parlamentary Republic, the Parlament is supreme,that rules , by the political parties that the general public may have approved. NO Constitution, that would be primery and supreme set of guiding principles above policy ,or political parties ,or their politicians. Evidently, to you it made no difference. As long as you support and are satisfied with that system, you have no ground yo object ! But I do, because am opposed to your kind of system of governance. That is what separates us ! Don’t I know it. Peter at least can put a sentence together. All you can do is lay big goose eggs. I bet you’re not even a goose but a duck.